Houston, Texas — By the time most folks reach their late 60’s, they are either retired or thinking seriously about trying it. WPRA World Champion Mary Burger is thinking about adding another gold buckle to her trophy case. Burger’s name is already etched into the record books as the oldest world champion in WPRA history; she was 58 years old when she won her title aboard the two-time AQHA/WPRA Horse of the Year she called Fred. A full decade later, Burger is pushing for another title and she cemented her spot in Las Vegas for the Wrangler National Finals Rodeo (WNFR) by claiming her second RodeoHouston title on Saturday afternoon, March 19. RodeoHouston is a tournament style rodeo with levels for advancement at each stage of the competition. Burger competed in Super Series I more than two weeks ago, earning $4,000 with a go round win and a third place check to move on to the semi-finals. In the semi-finals on March 16, Burger piloted her great horse Moe through the pattern inside NRG Stadium in 14.48 seconds, just good enough to keep competing. The final night is comprised of ten ladies, four from each of the two semi-finals rounds as well as two from the second-chance Wild Card. The Championship is always stacked deep in talent and 2016 was no different. There were two former RodeoHouston champs in the field, Burger and three-time reigning champion Nancy Hunter. Lisa Lockhart was in the final round again; the two-time WPRA Reserve World Champ has been the reserve champ at RodeoHouston the last two years. Brenda Mays was here on the final night a year ago as was Britany Diaz. Two-time WNFR qualifier Bean made the cut for the first time. And then there were the RodeoHouston rookies, Katelyn McLeod, Carley Richardson, Rachel Dice and Megan Swint. Dice was the first to run in the Championship. Their time of 14.26 was the best of the rodeo. Mays followed and came close, posting a 14.30. Bean ran into penalty troubles and Diaz went a little long at 14.65. Swint duplicated the time. Richardson continued her solid showing with a 14.27, sliding in between Dice and Mays. Then it was Burger’s turn. Burger turned in a 14.31 for fourth place. With only four moving on to the Championship Shoot Out, Burger was on the hot seat with the top two from a year ago left to go along with the tough rookie McLeod. However, Lockhart would make a rare mistake, tipping a barrel to put up the round’s best time at 14.17 while Hunter missed the cut with her 14.42. When McLeod pulled up four one-hundredths slower than Burger, the final field was set. The cowgirls have a small window to rest and prepare for what surely is one of the biggest runs of their lives. As RodeoHouston is approved by the WPRA, and the winner of the Shoot Out round wins $50,000, the next fourteen seconds could be the difference between a trip to the WNFR and possibly a World title, and being home on the couch watching it all unfold on TV in December. As the previous round winner, Dice led the way when the barrels were placed inside the huge arena for the final time in 2016. She and Katie stopped the clock at 14.76 seconds. Richardson and Radio were next and they continued to be the most consistent team in Houston over the last three weeks. Her time of 14.34 seconds went to the lead. Richardson posted times over the course of the rodeo prior to the final night of 14.26, 14.16, 14.35, and 14.23. Mays and her mare Dora were up next. They skimmed the cans and put up a time of 14.29 seconds, guaranteeing themselves no less than second, a paycheck worth $20,000. Then came Burger, the only cowgirl in the mix who already owns a RodeoHouston buckle, won back in 2009, also the last year she went to Vegas. She finished fourth in the World that year. On a Saturday afternoon in Houston, the grandmother and horse trainer brought down the house. Her deceiving run of 14.15 seconds was her second-best of the rodeo but plenty good enough for the big win and $50,000. With the win, Burger also joined rare company as one of just three WPRA cowgirls who have won RodeoHouston titles on more than one horse. Sherry Cervi has won it on three different horses while Burger and Celie Whitcomb Ray have done it two. With all her money adding up, Burger stuffed $54,750 in her Wranglers. She had already earned $28,000 since 2016 kicked off last fall. Burger will shoot to the top of the WPRA World standings having now earned better than $82,000. She will make her fourth appearance at the WNFR later this year, her first qualification aboard Moe. Mays came to Houston ranked 90th in the standings with extremely limited hauling but made good use of her time in Texas. Her $25,000 in Houston winnings will move her well inside the top 10 of the current WPRA World standings; like Burger, Mays is looking to make a return to Vegas aboard a different horse. 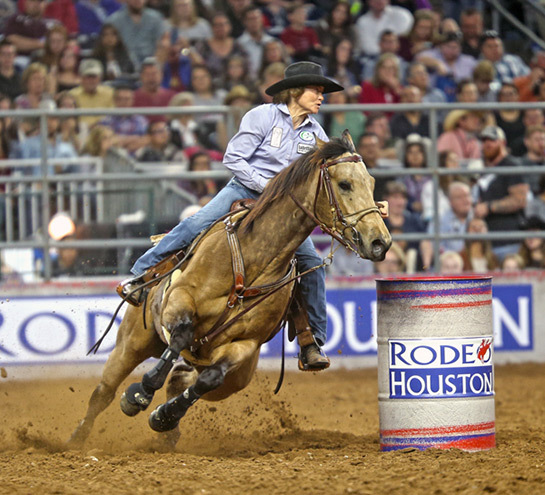 Richardson picked up $10,000 for her final run, pushing her RodeoHouston earnings to $16,750. Already ranked 16th, she too will move inside the top 10. Dice earned $5,500 in the Shoot Out and $9,500 total. For more information on RodeoHouston, please visit them on-line at www.rodeohouston.com.